Monday was a very exciting day in the Johnson apartment. We watched the season finales of Chuck and Heroes, and I made my first attempt at making Mark Bittmann's faster no-knead bread. 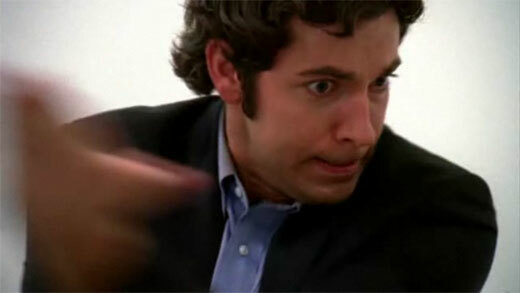 First of all, I should say that Chuck has basically become my favorite show on TV. It has the right mix of humor, action, and cultural references (that I actually understand) to be supremely entertaining. I am sure my enjoyment of the show has something to do with having worked for about a year in a CompUSA. While the antics that go on in the "Buy More" go far beyond anything I witnessed, some of the character types seem extremely familiar. I also interviewed to work for the Geek Squad (before they merged with Best Buy and became a mere shadow of their former selves), so I am connected to the setting of the show on multiple levels. The season finale was spectacular. Ellie's wedding provided a perfect excuse to bring the entire cast together, creating excellent humor (Jeffster singing Mr. Roboto) while Casey was tearing the room apart next door. Chuck's "upgrade" at the end was a singular moment of triumph, causing the audience in my living room to cry out in celebration. So, it is with a heavy dose of disappointment that I heard that NBC has not yet decided whether or not to continue Chuck for another season. Certainly, in order to continue, the show needs to prove that it can move in new directions while maintaining the humor which makes the show work. But, I think the writers have plenty of room for at least one more good season. The other thing which made Monday fantastic was homemade bread. I followed Mark Bittmann's recipe to the letter. I had my doubts because it was much more gooey than other doughs I have made in the past. However, the end result worked fantastically well. Phyllis and I nearly ate the entire loaf of bread in one evening. Suffice it to say, I will be making this again (but not too often for obvious reasons! ).